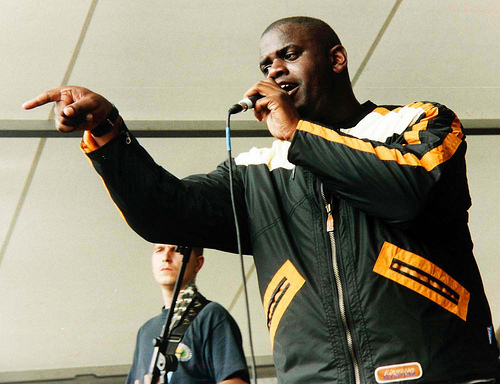 It's no surprise that Manchester gave birth to Audioweb and Martin 'Sugar' Merchant, their English-born Jamaican lead singer. The city has always had a history of developing artists and musical trends that have taken the U.K and the rest of the world by storm. The list of innovative and influential bands calling the city home includes 10cc, The Fall, Buzzcocks, Joy Division/New Order and The Smiths. During the early 1990's, Manchester gave rise to The Stone Roses, The La's and Happy Mondays who were all influential in their own ways. The city was also home to The Hacienda which rivaled Studio 54 here in New York in its heyday, as the center of Manchester's music scene. It was at the Hacienda that Merchant,who had honed his vocal skills as a reggae DJ and front man for the Saxon Sound System, first met the other members of Audioweb (who were initially called The Sugar Merchants after their lead singers nickname). My first introduction to Audioweb came when I borrowed the soundtrack to the 1999 movie 'Brokedown Palace' from a friend. I was immediately captivated by the song 'Policeman Skank (the story of my life)' which featured on the CD soundtrack. The song mixed ringing indie rock guitars with a dubby reggae bass line and what sounded like two vocalists -- one a singer with a melodic and captivating voice and the other a rough and ready Jamaican DJ. The combination was like nothing I had ever heard and I played the song incessantly. Only much later did I learn that Merchant was actually alternating between singing and toasting known as singjaying (which is a Jamaican style of reggae vocals combining toasting and singing that encourages rhythmically compelling and texturally impressive vocal embellishments). Merchant and his Sugar Merchant band mates were a very forward thinking bunch deciding to combine the indie rock guitar sound of 'Brit Pop' then sweeping the U.K. with straight-up reggae bass lines and Jamaican-influenced vocals. The band signed to Elektra in 1991, but after a period of four years (and only a dozen concerts) the label dropped them. Using the time to re-tool and re-focus, the band re-emerged as Audioweb recording a demo with 3 tracks, including the song 'Sleeper', which got them signed to U2's Mother Records before they even played one show! While their unique combination of rock, dub, soul, reggae and dance sounds quickly garnered significant media attention, the band and its sound was clearly way ahead of its time. Indeed, the British music media seemed to be confused by the band and unable to pigeonhole their sound (what I would deem Fishbone-syndrome) tended to overlook them. Despite the release of a rousing cover version of The Clash's 'Bankrobber' (which was blessed by Joe Strummer) and the classic 'Policeman Skank' (which both scored the band top 20 UK hits) as well as support slots with U2 and Madness, the band struggled to get the support and recognition it deserved despite two albums worth of melodic and hit-worthy songs and parted ways in 1999. (If you want more information about the band and its history, there is a great fan-generated web site called Republic Of Audioweb. I highly recommend it). I've always believed that Audioweb were poised to be the band that would pick up the torch for U.K. band's like The Equals in the 60's and Basement 5 in the 70's who took reggae and mixed it with pop and punk. I also believe musical racism prevented Audioweb from reaching its full potential as they had to struggle against the prevailing conventional wisdom that reggae should be played by reggae bands and rock should be played by rock bands and never the twain shall meet. Indeed, the idea of a rock band fronted by a black man seemed to confuse people even in the 90's! Even when Merchant and the band performed full on melodic songs that fit the sound of the day, they were overlooked by the UK music media and radio. This was a travesty and likely led to the break-up of the band in 1999 after releasing their second album 'Fireworks City'. For me and their many fans it was potential gone unfulfilled. For a sense of the band's powerful live show check out 'Personal Feeling' from a 1998 show. It has all the elements for a hit song - loud guitars, soaring vocals and a hook. I'm happy to report that after taking some time off, Merchant is back with a new band -- SupaJamma -- who have picked up where Audioweb left off and have recently released a new mini-album worth of heavy rock meets reggae. I had the honor to connect with Merchant recently, who shared his thoughts on growing up in Manchester, as well as his memories of performing with Audioweb and his new band. What was like for you growing up in Manchester in the late 70's and early 80's? How did that effect you musically? In the 70's and 80's my roots was reggae. I went to the local youth club where all the sound systems would play the latest reggae from Jamaica and England. In the 80's I was into a bit of soul and funk and later into the 2-Tone stuff like The Beat, Madness and The Specials. What music did you hear in your home when you were growing up? When I was growing up my Dad had loads of blues parties, so mostly reggae was played. But on Sunday morning, my Dad would play Jim Reeves and Pat Boone along with reggae. If you had a party in your house you had to play the reggae hits. Do you remember the first record you ever bought? I think my Mum got me Desmond Dekker's 'You Can Get It If You Really Want It'. Manchester is famous for its incredible musical diversity. How did that influence you as a musician and an artist? Well I loved 60's music like Manfred Mann, The Rolling Stones and The Beatles, so when the Manchester boom of the early 90's happened it just reminded me of the 60's. I love the first and second Oasis albums as well as The La's and Stone Roses. Which reggae artists are you most influenced by? Did you follow any Sound Systems in Manchester? I like all reggae from 1963 -2007. I sang on most Sound Systems in Manchester. I also sang on Maverick Sound from Leeds and then on Saxon Sound System where I was spotted by Tippa Irie and Daddy Colonel. When did you discover you could sing and chat? Do you remember the first time you mixed the two in a song? When I started I was not a very good deejay but my singing voice was better. Audioweb was clearly ahead of its time with you doing both the singing and chatting. Did you and your bandmates consciously decide to mix indie rock with reggae? With Audioweb we all liked all kind of style of music so it was like a melting pot. Tell me about the story behind the lyrics for the song 'Policeman Skank'? We were recording some b-sides one day and I came in to the studio late while the band were jamming on this groove so i just singjay on it. Its a tale most people could relate to. Is the song 'Sleeper' (which is one of my favorites) inspired by The Beatles 'I'm Only Sleeping'? No it was not inspired by The Beatles. It was our take on the world around us. Do you think Audioweb got a fair shake from the UK music press? I always had the sense that they could not wrap their head around an indie band mixing guitar rock and reggae fronted by a black lead singer. Yes you are right. I don't think we got fair press at all and I don't think the press knew any black people. I think that part of the press was very racist but we knew it would be a problem but I've had to deal with racism all my life. Manchester is multicultural place but the music of the 90s did not reflect it at all which was a shame. The rock and pop press like when there 4 or 5 white guys in a band. The only time a black guy has a chance of making money and being famous in England is in sports! Why didn't Audioweb ever make it to the U.S. to tour? I think you would have gotten a great reception here in places like New York and Los Angeles. The record company was obsessed with breaking the U.K. and did not give it a chance anywhere else. I think would have gone down a storm in the U.S.A.
Tell me about your new band SupaJamma? The band is starting to get good reviews in the U.K. music press, How would you describe your sound? Now 11 years later Supajamma are a lot more rockier than Audioweb ever were. A few years ago one of my best friend's Simon was saying we should do some writing together. Then we got a live band with Bev's, Steve, Dan and Simon on bass and writing partner and me vocals and writing. It is a very different music time now.We got some great songs but it is tough out in the music world. Do you think the U.K. music public is finally ready for a mix of rock and reggae? England will never come around to the mix of reggae and rock. Audioweb was the group that had the mix right but you need money and promotion and luck. A lot of people like the old reggae of the 70's and 80's and 90's but not enough to get it in the charts. I have had the best time doing music. I've been around the world. I love the fact that I was born in England and my parents are Jamaican. I had so much music to enjoy. I know you also DJ around Manchester right? What can someone coming to one of your DJ gigs expect to hear? I now deejay at the mod and skinhead bash playing ska, rocksteady and early reggae and I mash up the place trust me. What are your fondest memories of performing with Audioweb? The greatest time with Audioweb was on tour with U2. We did 8 dates supporting them . Going on TFI Friday three times was killer and doing two albums. Touring was a laugh as well. This Is England '90 Gets The Green Light!